Alberta again has the highest rate of entrepreneurship in Canada, confirming what we have seen for the last five years. The Global Entrepreneurship Monitor (GEM) report on Entrepreneurship in Alberta shows that 19.6% of Albertans aged 18-64 are involved in starting a business. This is higher than the rate for Canada as a whole (18.8%) and higher than all other innovation driven economies including the US, Australia and Israel. Although Alberta has a slightly higher rate of established businesses than Canada as a whole (7.5% vs 6.2%) it is lower than the US or Australia. Alberta also has a lower rate of intrapreneurship than the Canadian average, 5.7% compared with 6.6%, similar to last years findings. This factor can be linked to a firm’s innovation and productivity strategies. Who are these entrepreneurs? They are highly educated, with most having a university or college education, many with graduate degrees. The rate of entrepreneurship rises steadily with the amount of education, peaking in those with some post graduate experience. Their ages vary, with entrepreneurship rates peaking in the 25-34 and 55-64 age group. The entrepreneurship rate in the 55-64 age group is two and a half times the Canadian average, and supports a narrative of older workers losing their jobs in the weak economy. For Established Businesses, the rate increases steadily with age, as expected, but Alberta has a surprisingly high rate in the 18-24 age group. The rate of women’s entrepreneurship is almost 90% of the male rate, one of the highest ratios in the world. It is much higher than the Canadian average of 66%. What do they do? Alberta has a very different startup industry profile than Canada. GEM puts businesses into four categories – extractive (oil and gas, mining and agriculture); transformative (manufacturing), business services and consumer services. Alberta has two and a half as many extractive businesses, twice as many transformative business, roughly similar business services, and far fewer consumer oriented businesses than Canada as a whole. Why do they do it? Most entrepreneurs say they started their business to purse an opportunity, although 23% do so out of necessity, because they had no other economic opportunities. The necessity rate is 50% greater than the Canadian average, and this may reflect poor economic conditions in Alberta. It is worth noting that in 2014 (when the economy was much stronger), the necessity entrepreneurship rate in Alberta was only 8%. Size and Growth. Startups in Alberta are much smaller than the Canadian average. One third of all Alberta startups have no employees, compared with 22% in Canada. And only 6.7% have 20+ employees, compared with 12.9% for Canada as a whole. However, almost a quarter of Alberta startups plan to have 20 employees in five years’ time. How innovative are they? 40% of Alberta startups say they have no novelty in their products or services, the highest rate in Canada. This would indicate a low level of innovativeness. This is corroborated by the metric that over 60% of Alberta startups use older technology, also the highest rate in Canada. However, 12% of Alberta startups say they have no competitors, the highest rate in Canada. So it looks as if there are a few very innovative startups among an overall pool of low innovations. How supportive is the ecosystem? GEM measures ecosystem performance by polling 36 experts in nine separate areas of expertise. By these measures, Alberta is similar to Canada as a whole, except performance is a little lower in most measures. Alberta is equal to or better than Canada in 4 of the 9 measures used in the report. GEM is the oldest and largest study of entrepreneurship in the world, covering 60+ countries every year. Continue to highlight opportunities for entrepreneurs in the province and develop tactics to mediate fears in future training initiatives. Consider ways to increase Employee Entrepreneurship?Intrapreneurship within Alberta. Aim to close the gender gap completely and investigate further why Alberta is more successful in this area than elsewhere across Canada. Provide support for burgeoning entrepreneurs with high growth expectations within the province in order to optimize their impact. Follow expert advice and look for improvements in Government Policies, Finance, and Education. The full report is available at GEM Alberta 2017 Report. Alberta has the highest rate of women’s entrepreneurship in Canada. The Global Entrepreneurship Monitor report on Women’s Entrepreneurship in Alberta shows that 15.5% of Alberta women aged 18-64 are involved in starting a business. This is higher than the rate for Canada as a whole (13.3%) and higher than all other innovation driven economies including the US, Australia and the UK. Who are these entrepreneurs? They are highly educated, with most having a university or college education, many with graduate degrees. Their ages vary, with entrepreneurship rates peaking in the 18-34 and 55+ age categories. What do they do? Most (almost 70%) of their businesses are service based, evenly split between business services and consumer services. The next largest category (at 19%) is “extractive” businesses, such as mining, oil, and gas and agriculture, and the balance is manufacturing. This profile is quite different from that of Canada as a whole, where consumer services is by far the largest sector (at 41%) and extractive businesses are half the Alberta rate. The top six sectors are government/education/health; agriculture; professional services; manufacturing; retail; and finance/insurance/real estate. Why do they do it? Most women entrepreneurs state that their business is to purse an opportunity, although 25% do so out of necessity. The necessity rate is almost twice the Canadian average. The report also provides detailed information on motivation. The main reasons women start a business are independence, a positive work environment, a flexible schedule, and the ability to work from home. What impact do they have? Most women led businesses are smaller than businesses led by men. Over one quarter of women entrepreneurs operate as solo entrepreneurs with no employees. 7% of women led businesses have created more than 20 jobs. This compares with 10% of businesses led by men. In terms of future job growth, 17% of women led enterprises expect to create 20 or more jobs in the next five years. How innovative are they? About 30% of women led businesses in Alberta claim to have a new product, process or new market, compared with 33% of businesses led by men. Both of these numbers are lower than the Canadian average. Do they export? 26% of women led businesses in Alberta export, compared with about 30% for businesses led by men. Both of these numbers are lower than the Canadian average. Canada as a whole ranks highly by this measure, being #3 globally for exporting. How satisfied are the entrepreneurs? Most women entrepreneurs in Alberta say they are satisfied with their work. The highest ratings for satisfaction are related to having decision making autonomy over how work is accomplished, and doing work that is personally meaningful. The lowest ratings for satisfaction relate the level of work stress, the growth trajectory of the business, levels of income and work related stress. What challenges do they face? Women entrepreneurs face a number of challenges in Alberta, despite their overall very positive situation. Many women entrepreneurs report dissatisfaction with the annual growth rate of their businesses, and the degree of innovativeness. Although there are a number of programs aimed at growth oriented women entrepreneurs in Alberta, it would appear that more needs to be done. A quarter or women entrepreneurs are entrepreneurs because they have to be, not because they want to be (i.e. necessity based entrepreneurs). This suggests that other factors are involved, such as a weak labour market, difficulty accessing training, or problems finding flexible job opportunities. Women entrepreneurs are underrepresented in lucrative, innovation sectors such as knowledge intensive business services and scientific and technological sectors. As report author Karen Hughes notes, in recent years Canada has become increasingly recognized as a leader in women’s entrepreneurship. This report provides plenty of evidence to support that conclusion. Highly educated entrepreneurs see it as a good career choice. The recently released Global Entrepreneurship Monitor report on Youth Entrepreneurship shows that youth entrepreneurship is alive and well in Canada. The Global Entrepreneurship Monitor (GEM) is the largest study of entrepreneurship in the world. Canadian Youth see entrepreneurship as good career choice and associate it with high status. Over 60% of Canadian youth saw entrepreneurship as a good career choice, and having high status, and three quarters saw it as having high status. Most also saw it portrayed positively in the media. They feel confident that they have the skills and experience needed to start a business. More than half felt they had the skills and experience need to start a business, although around 40% expressed a fear of failure. However this is about 10% less than expressed by the 18-64 age group. However, we found in other GEM reports than the experts are quite skeptical of these views. They want greater independence. There has been a pronounced shift in the last 4 years to increase the fraction of youth entrepreneurs who seek greater independence, rather than to increase income. More than twice as many of the youth entrepreneurs we interviewed valued independence more than increased income. They are highly educated. Over 60% of youth entrepreneurs have a post-secondary degree, while among the youngest youth entrepreneurs (ages 18-24) 16% have post graduate experience. This compares with 54% of the 18-64 age group in Canada who have a post-secondary qualification. Consumer services form the largest share of youth entrepreneur’s ventures. It is typical of most reports on entrepreneurship that consumer services are the largest single business category. There are low barriers to entry and frequently a relatively low need for capital to get started. 45% of youth entrepreneurs’ ventures are for consumer services, 32% for business services and 20% for manufacturing. Personal savings is the primary source of funding. 58% of youth entrepreneurs funded their ventures with personal savings, 19% by bank loans and 9% from family. The median value of the investment to start their business was $268,214. There is a gender gap, as female youth exhibit less confidence and a higher fear of failure than their male counterparts. The overall entrepreneurship rate for youth is slightly lower than the Canadian population. In 2016 14.1 % of youth were involved in entrepreneurial activity, compared with 16.7% of the total 18-64 population. This is perhaps not surprising as generally people need to accumulate money and experience before starting a business. An increasing number of Youth are running established businesses. In GEM, an established business is one that has been around for 3.5 years. The number of these headed by Youth has risen quite rapidly in the last four years. Ontario and Alberta are hubs of youth entrepreneurship. The rate of youth entrepreneurship varies quite a bit across Canada. Highest rates are found in Ontario, Alberta and Quebec, while lower rates are found in Newfoundland, New Brunswick and PEI. The full report is available at www.gemcanada.org – look under 2017 (when the data was collected). Measuring Entrepreneurship – Lies, damn lies and statistics. British Prime Minister Benjamin Disraeli is reputed to have said that there were “three kinds of lies – lies, damn lies and statistics” as a sort of tongue in cheek way of advising caution when interpreting numbers. A case in point is entrepreneurship statistics. Various explanations for this decline have been put forward. The Forbes article places the blame on large student loans, making potential entrepreneurs more risk averse. A recent article in the Globe and Mail believes that demographics is to blame – the aging of the population and decline of the number of potential entrepreneurs in the prime age group of late 20’s to early 40’s. Another explanation is the lack of equity funding compared with the US. On the other hand, data from the Global Entrepreneurship Monitor – the world’s largest study of entrepreneurship, tells a different story. In Canada, for example, the rate of entrepreneurship (measured as the TEA Index of total early stage entrepreneurship activity) has increased from an average of 8.6 (for 2002-2006) to 15.1 (for 2013-2017), almost doubling. In the US the numbers have gone from 11.2 (average of 2002-2006) to 12.9 (average of 2013-2017). That’s not such a big increase as Canada, but it’s definitely not a decline. Australia shows a similar increase from 11.9 (average for 2003-2006) to 13.2 (average for 2014-2017). The first thing to note is that the two groups are looking at different sources for their data. The “falling” group looks at company registrations, where a new company has been formed. The “rising” group look at actual activities, what percentages of the adult population are actually involved in entrepreneurial activity, whether the activity is part of a registered company or not. But what could be behind this? A very likely explanation is the gig economy. A report by Randstat Canada (the largest staffing company in Canada) says that 30% of the Canadian workforce is already in “non-traditional” jobs, including part time work, temporary work, contract work, and freelance work, self-employed or unpaid work. This number has increased significantly in recent years, and is expected to rise to 45% by 2020 according to Intuit Canada. A report from Ryerson University found that over 50% of all new Canadian jobs involve “non-standard” work arrangements. Very similar numbers are predicted for the US. There is a theoretical underpinning to this change. Ronald Coase won the Nobel Prize in economics by explaining that firms exist to minimize transaction costs. It was cheaper for General Motors (for example) to assemble all the materials to make a car than to contract with others to do the same thing. That was then. Now the computer revolution has made it much easier and cheaper for firms to do work by contracting with freelancers, and outsourcing significant parts of their activities. Also, it is easier for people to find work using apps such as Uber, Airbnb, Handy and TaskRabbit that trying to find full time employment. And perhaps they value the flexibility as well. It looks very likely that we will see further increase in entrepreneurial activity in Canada. It remains to be seen how much of this is done through registered companies and how much of it is done on a freelance or sole proprietorship basis. Women’s entrepreneurship continues to attract a great deal of attention and interest around the globe, given growing evidence of its economic and social impact. Initiatives such as the World Bank’s Women’s Entrepreneurship Financing Initiative (WE-FI), and Goldman Sachs’ 10,000 Women Program , are just two examples of a growing range of initiatives aimed at supporting and encouraging women-led business. Within this global context, Canada has emerged as a leader in women’s entrepreneurship, with the highest levels of early-stage activity (TEA), and the fifth highest established business ownership (EBO), amongst innovation-based economies. In 2016, 13.3% of Canadian women engaged in some form of early stage business activity, involving a business that was 3.5 years old or younger. This was up from 10.0% in 2014, and marked the highest rate of women’s TEA in 2016 amongst comparable innovation-based countries. Comparing Canada to other G7 countries—such as the U.K. (5.6%), Germany (3.1%), France (3.4%), and Italy (3.3%)—helps to underline the striking and high level of Canadian women’s participation in early-stage business. 6% of Canadian women were engaged in established businesses – those more than 3.5 years old – the fifth highest rate among comparable countries. Canadian women entrepreneurs are found across all age groups, though start-up rates are highest among women aged 25-44, while the majority of established business owners fall between 55-64 years of age. Women entrepreneurs are highly educated, with 12% having a graduate degree and 53.8% having a college or university degree. 82% of women indicated they were motivated to start a new business by opportunities, up notably from 70% in 2014, while only 14.5 % were motivated by necessity. Another way to develop innovation policy? At a meeting I was at recently, Gandeephan Ganeshalingam, the Chief Innovation Officer for GE Canada, described their view of the business environment using the acronym “VUCA”. This stands for volatile, uncertain, complex, and ambiguous. This is clearly a very challenging environment in which to operate. Now think about how innovation policy has traditionally been developed. Often there is a commission (such as the Jenkins Report, that studied Federal support for research and development) that studies an issue, and issues a report with recommendation. This is often followed by extensive period of consultation with various stakeholders. Then a policy is announced, sometimes legislation is proposed, and then the policy is implemented. This process often takes many months if not years. So how likely is it that an innovation policy will work for a company in a VUCA world? Good question! Set up pilots to experiment with new programs. One randomly selected group gets the new program, another randomly selected group doesn’t. Evaluate them using rigorous methods. Scale up those that work, stop those that don’t work. Randomized controlled trials (RCTs) have been used in a number of policy areas such as development (by the World Bank), education and social policy. They are the gold standard for evaluating new drugs and medical procedures. In all of these areas the link between an intervention and desired outcomes is uncertain because no adequate theory exists. RCT’s provide empirical evidence whether an intervention actually works or not, and provide a strong evidence base for a new policy. As one of the reports says, it replaces reliance on ‘eminence, charisma, and personal experience’ with evidence of what actually works. RCTs haven’t been used much for developing innovation or entrepreneurship policy, but there is a large potential for exploring its use in those fields. RCTs, like all new tools, have their strengths and limitations, and require expertise to be used effectively. They won’t be used across the board, just in a few selected areas. A key strength is that they can provide empirical evidence for a new policy, and minimize influences of ideology or history. One weakness is that they don’t explain why an intervention works, only if it does or not. It is interesting to note that when randomized controlled trials were introduced in medicine, they were strongly opposed by some clinicians, many of whom believed that their personal expert judgement was sufficient to decide whether a particular treatment was effective or not. However randomized controlled trials are now regarded as the gold standard for medical evaluations. Governments at all levels in Canada spend a great deal of money supporting innovation and entrepreneurship. Randomized controlled trials can be another tool in the tool kit to make sure that we get the best possible outcomes. There is very significant expertise in the medical community to draw on to assist this endeavor. Entrepreneurship is alive and well in Alberta, according to the latest GEM (Global Entrepreneurship Monitor) report, just issued by THECIS. Over 17% of the adult population is engaged in early stage entrepreneurship, a higher rate than in the US, Australia and all other advanced countries. Women are very active in early stage entrepreneurship, at 80% of the men’s rate, also higher than the US. Consumer services is the most popular field, with just more than 50% of ventures, followed by business oriented services at 30% and manufacturing at 20%. Age is an important determinant of entrepreneurial activity, with higher rates in the 18-24 and 25-34 age groups. Overall, however, about half of new ventures are led by people aged 18-34, and half by those aged 35-64. Above age 65 the rate drops off, but still 4% of older Albertans are active as entrepreneurs. Education is also a key determinant of entrepreneurship. As people acquire more education they become more entrepreneurial. The highest rate of entrepreneurship is found among those with post graduate education. The Alberta population is very supportive of entrepreneurship, with 60%–70% of respondents believe that entrepreneurship is a good career choice that successful entrepreneurs have high social status, and that media provide favorable coverage of entrepreneurship. About 15% of startups are highly innovative, having no direct competitors. About 40% of startups are in sectors with many competitors. 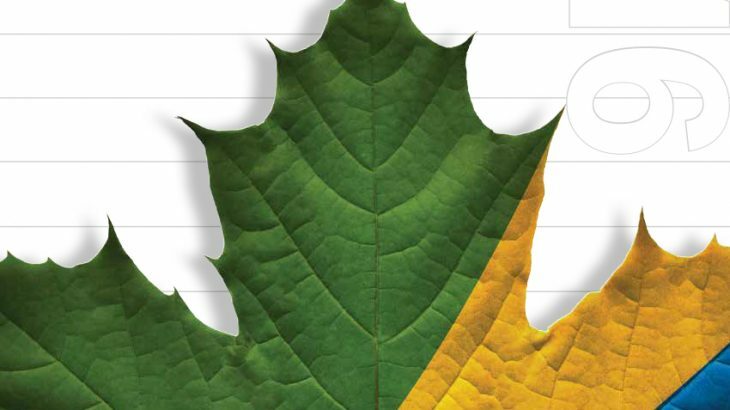 Experts were asked to evaluate the Alberta ecosystem by rating nine relevant factors. The five with the best scores were: physical infrastructure, commercial infrastructure, social and cultural norms, government programs, and government policy at neutral. The lower five in decreasing order were post-secondary education at neutral, R&D transfer (to small and growing firms), internal market dynamics, finance, and primary and secondary education. The experts were also asked to rate to biggest constraints and fostering factors. The most mentioned constraints were finance as the top priority with capacity for entrepreneurship and government policy as next areas of priority. The most mentioned fostering factors were cultural and social norms as highest priority with the economic climate and, surprisingly, the low rated question of education and training as second and third areas of priority. Creative government programs are needed to support entrepreneurship that has promise to create new directions. This needs to involve all departments of governments, not only those with responsibility for small business. School systems need to examine the opportunities to promote entrepreneurial thinking in the context of education aimed at encouraging independence and creativity. Despite the evidence that entrepreneurship by women in Alberta is stronger than in other parts of the country or in other developed countries, a gap remains and attitude and motivation data indicate that women still have less confidence in skills and knowledge and women entrepreneurs have more complex motivations. Information programs and mentorship for women remain a priority. With the low rate of seniors’ entrepreneurship and the expected increase in size of this demographic in better health in the future, consider targeting entrepreneurship programs at older Albertans. Data show rates of entrepreneurship rise with increase of educational experience. Education for entrepreneurial thinking should be promoted across all types of secondary and post-secondary programs. GEM (Global Entrepreneurship Monitor) is the largest study of entrepreneurship in the world. THECIS manages the GEM project in Canada. The latest GEM report for Canada has just been issued. It is available at http://thecis.ca/index.php/gem-2016/ It shows that there is a very strong entrepreneurship culture in Canada, and the rate of early stage entrepreneurship (TEA -Total Early stage Activity) is the highest in the developed world. GEM data is widely used as evidence for evidence based policy by such groups as the UN, OECD, World Bank and World Economic Forum. No more than 44% are inhibited by fear of failure. 7% of the adult population is involved in early stage entrepreneurship, the highest rate in the developed world, ahead of Australia and the US. 8% of the adult population in Canada is involved in an established business (one more than 42 months old), a lower rate than in Australia or the US. In terms of intrapreneurship (entrepreneurship in large organizations) Canada’s rate is 6.5%, that ranks us 12th among developed countries. A significant number of startups have major growth plans. Twenty percent expect to create 20 or more jobs within five years. In common with most other developed countries, the largest sector for entrepreneurship (48%) is consumer services, closely followed by business services. A significant minority of startups export. 20% of them project from 25% to 75% of revenue from export, and 13% anticipate more than 75% of revenue from export. A significant minority of startups offer innovative products or services (9%-14% depending upon the questions asked. 17% of startups use technology available only in the least year, an indicator of innovativeness. The age group with the highest TEA was the 25 – 34 age group, at 22.3%. The rates decline sequentially for the 35 – 44 group, the 45 – 54 group, and the 55 – 64 age group. The TEA rates decline reaches 10.7% among the 55 – 64 cohort. Approximately 50% of total startup activity is in the 18-40 age group. The rate of women’s entrepreneurship is about two-thirds the male rate, which is comparable to other comparison countries. The rate of entrepreneurship increase steadily with education, being highest among those with some post graduate experience. The rate of entrepreneurship increases across Canada from east to central Canada, and is similar across the west. The strongest aspect of the Canadian ecosystem is physical infrastructure, commercial infrastructure, and the relevant social and cultural norms. The weakest aspects are the lack of education for entrepreneurship at primary and secondary levels, and availability of finance. Provide more targeted assistance to young and growing firms. Provide more education and mentoring to potential women entrepreneurs. Expand entrepreneurship training in entrepreneurship in post-secondary institutions. Provide targeted resources for senior entrepreneurs. Support entrepreneurs who want to export. Encourage firms to develop strategy utilizing more intrapreneurship. How to get more innovation? Prizes. Cash prizes have a long history of stimulating innovation. One of the earliest examples is the Longitude prize, offered by the British government in 1714 to anyone who could determine longitude accurately. That prize was eventually won by John Harrison, for an accurate clock. The XPrize is a more recent example, which was set up to bring about “radical breakthroughs for the benefit of humanity”. The XPrize has stimulated numerous other prizes, including one in Alberta run by the Climate Change and Emissions Management Corporation (CCEMC) to find commercially viable applications for waste gas. Military spending. This is a very wasteful way of generating innovations, but it can produce very significant results. Mariana Mazzucato has shown that many of the technologies in the iPhone were originally developed and used by the US military before being “re-purposed” and incorporated into the iPhone. The internet is another example, which was originally funded by DARPA (Defense Advanced Research Projects Agency) in the US. Government funded megaprojects. There are a few examples of megaprojects that have developed significant innovations. One is the man on the moon project in the 1960’s. This was a political, not scientific project that occurred at the height of the cold war. NASA considers Landsat satellite imagery to be a direct result of this megaproject. However this is a very wasteful way of getting innovations. Another example might be the Chinese government’s initiative – the Belt and Road project – to spend significant resources to enhance trade across Eurasia. Because of the magnitude of resources required, this will always be a very minor contribution to overall innovation. Surprisingly, regulation can sometimes stimulate innovation. A classic example is the role of the California Air Resources Board (CARB), which imposed stringent fuel economy standards for all automobiles sold in California, in 1967. This led automakers to develop innovations to significantly improve fuel economy, not only for cars sold in California but everywhere else as well. There have been numerous other similar examples. Carbon taxes and cap and trade systems are intended to stimulate innovation by the same mechanism. Nobody wants to pay taxes and people and companies work to reduce emissions and so pay less tax. Sometimes innovations just happen without any apparent motivation. The “learning by doing”, “experience curve” or “learning curve” effects are based on a series of often very small changes which cumulatively have a powerful effect. When a routine task is repeated, each cumulative doubling of repetitions typically leads to a reduction of 10-20 % in cost per unit. New Technology. The classic example of a new technology stimulating innovation in the old technology it aims to replace is the sailing ship. In the 30 years after the introduction of the steam power in the 19th century, sailing technology improved more than it had in the previous 300 years. This is termed the “Sailing Ship effect”, which has been well documented in numerous other cases. None of these approaches include current hot topics such as research and development spending, venture capital, crowdfunding, tax credits or other popular ideas. This is not at all to say that these approached don’t work, but just to remind us that there are many paths to innovation. Losing jobs to machines: is it different this time? A number of recent studies have described the jobs that will be lost to automation in the next few years. The World Economic Forum estimated that 5 million jobs will be lost to robots in the next five years, globally. The Brookfield Institute for Innovation and Entrepreneurship at Ryerson University issued a report that found that nearly 42 percent of the Canadian labour force is at a high risk of being affected by automation in the next decade or two. They found that the top five jobs at risk of automation were: retail salesperson, administrative assistant, food counter attendant, cashiers and transport truck drivers. This report is consistent with other long-term trends in the economy. 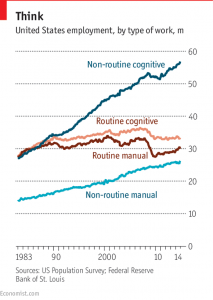 For example, a report in the Economist looked at employment growth in routine vs. non-routine jobs, and found that non-routine tasks grew much faster in the last 30 years. The impact of automation and artificial intelligence seem so far-reaching that some people suggest it will permanently reduce the number of jobs needed in the economy. A recent study by the National Bureau of Economic Research in the US found that each new robot added to the workforce meant the loss of between 3 and 5.6 jobs in the local commuting area. Meanwhile, for each new robot added per 1,000 workers, wages in the surrounding area would fall between 0.25 and 0.5 percent. Fear of changing technology is noting new. A hundred years ago the Luddites destroyed weaving machinery they believed was threatening their jobs. However, there are strong views saying that we shouldn’t worry about automation. In a poll of Canadians Abacus Research found that 89% of Canadians agreed that technological change has been good for the world. And 76% felt it had been good for their own economic well being. They may be on to something. According to the Global Entrepreneurship Monitor study of entrepreneurship, Canada is the most entrepreneurial country among the advanced countries. Entrepreneurship is basically creating new jobs by following opportunities, whatever the rest of the economy is doing. Carolyn Wilkins from the Bank of Canada points out that technological change has been part of the Canadian economy since Canada was founded 150 years ago. 100 years ago one third of jobs were in agriculture, today fewer than 2% are. So there are optimists and pessimists. Who is right? And is it different this time? Expand adult re-training. It is pretty clear that many people are going to loose their jobs, and will need to find new ones. Update the education system to increase the focus on preparing people for the non-routine jobs that seem likely to dominate the economy in the next 50 years. Experiment with novel social programs that may be needed if the pessimists are right. A good example of this is the basic income experiments being carried out in many places round the world, including California, Finland,Italy, the Netherlands and in Ontario. THECIS. All rights reserved. THECIS optimized by Website Optimization Canada.